A few weeks ago I went garage sale shopping and walked away with this wooden student desk in desperate need of TLC. I knew it was gonna take a lot of elbow grease to get this baby looking new again. I was right about that, but even I didn’t realize how much work I actually took on! 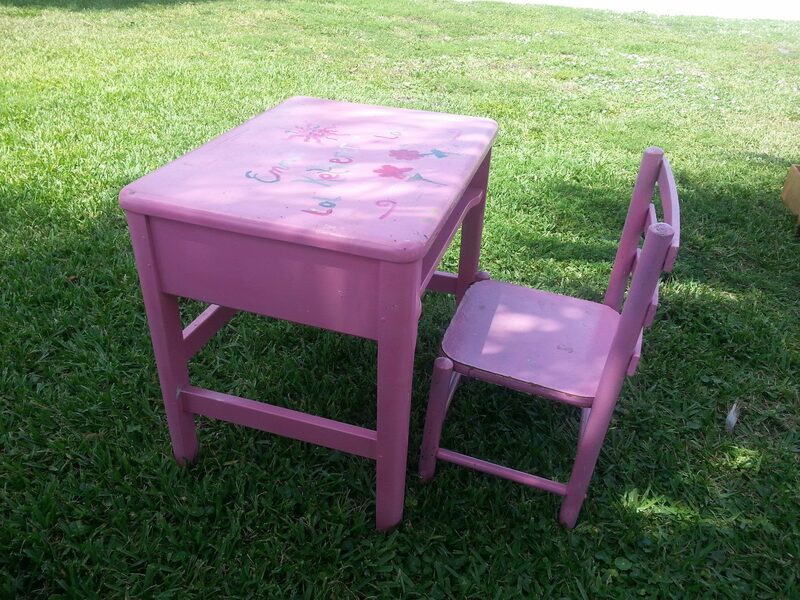 Before Picture of Child Size Student Desk[caption Before picture of the child size chair. 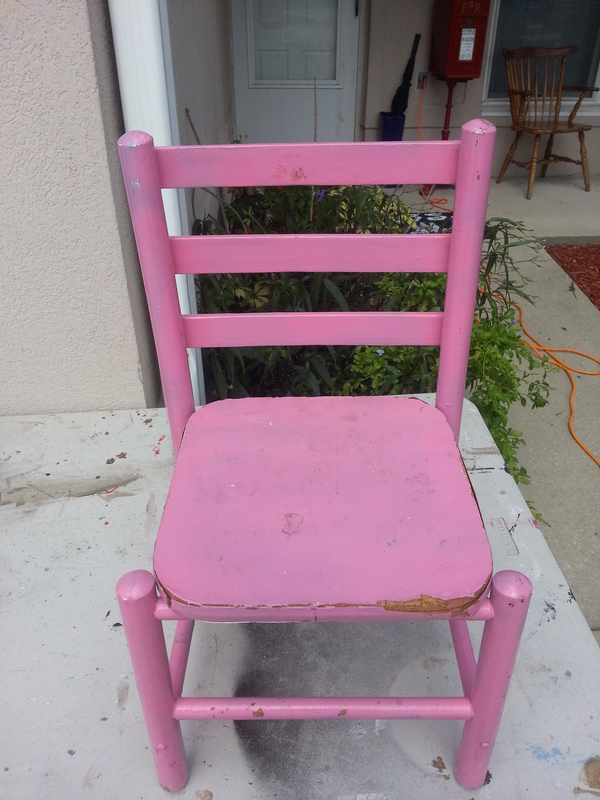 [/caption] I first started sanding it to get most of the spray paint and nail polish mess off, and being that I planned to use chalk paint (which usually covers everything) quit at a light rough up. As soon as I started painting I noticed how the paint wasn’t adhering properly and there were areas that looked very weird! It looked almost clumpy. I knew right away that I was going to have to sand it all the way down. So, I let the paint dry and the next day went to sanding. What a nightmare that turned out to be! Under the spray paint was layers of other colors and some kind of primer that when sanded turned to a blackish grey tar like goo! I went at it for some time then talked to the hubby. We both decided that a paint stripper might be a good way to get all those layers off. So I went to my favorite home improvement store and get some. Sanding the desk was a nightmare! you can see the layers of paint and tar like goop. YUCK! [/caption] That day I come home, suit up for chemical warfare and get to stripping…paint! SMH! (Shame on you for thinking otherwise! ;) WARNING: Make sure you have the correct gloves for the job. Paint stripper will eat though regular household gloves. Long sleeves are also a good idea. Chemical burns are not something you want to experience! I’m gonna cut right to it. The paint stripper didn’t work so great. It did however “loosen” the hold of the paint making it easier for me to sand. Unfortunately that’s when the rain started. For days, we folks in Florida were experiencing the damp weather and while I love a good thunder storm, it is really bad for business. 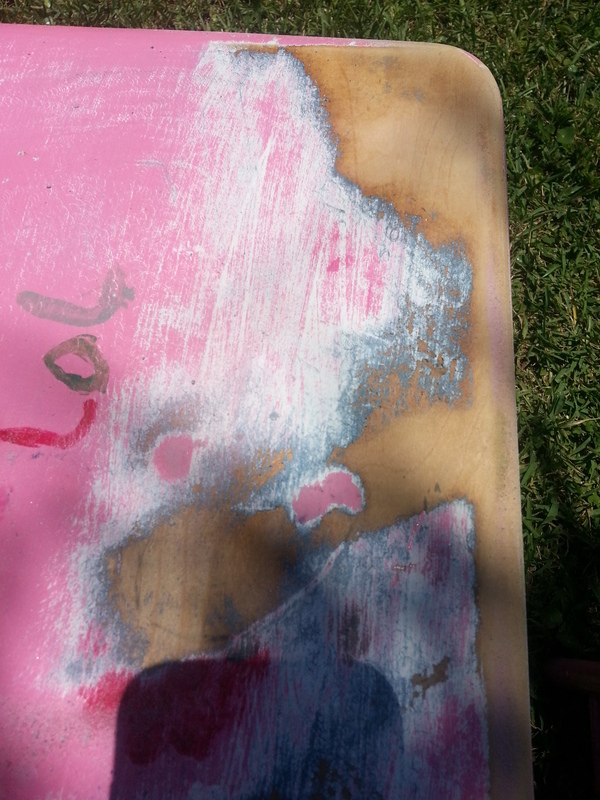 I sanded when I caught a dry spell it took days and one pack of coarse sandpaper. After about a week I had the desk and chair down to the wood. I smoothened out the wood with a fine sandpaper and cut some slats for a new chair seat. 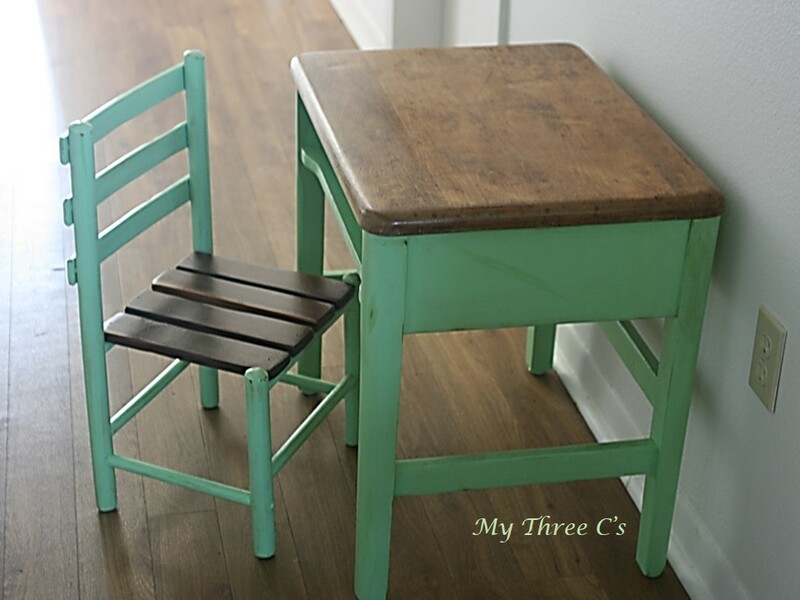 I decided to paint it a nice light green so that it could be used by a little boy or girl and kept with a traditional golden pine stain. I’m very pleased with the results! Antique Desk refurbished in a Lime Sorbet and Golden Stain.